"I believe in people, and you don't need to be a feminist for that," Bernier, leader of the fledgling People's Party of Canada, said Tuesday in an interview with CBC News Network's Power & Politics. Canada's three main party leaders have all declared themselves feminists, but Bernier said he doesn't like the term because of its association with left-wing politics. "I'm not focusing on you because you are part of a faith, or because you are a lady, or because you are man, [but] because you are Canadians," he said. Bernier said he won't commit to appointing a gender-balanced cabinet should he become prime minister, but added he hopes to have a lot of women running for his party and taking part in a future cabinet. "I won't say that I will have 50 per cent men, 50 per cent woman, but the ratio must be around that," he said. "If you're choosing somebody that doesn't have the competence, but because it's a young guy, or it's a lady or if it's a man, it's a positive discrimination and I won't push that." Bernier also parts company with his fellow leaders over the Paris climate accord; he said he'll pull Canada out of the international climate agreement if his party wins power. Prime Minister Justin Trudeau signed the treaty in 2016, committing Canada to lowering greenhouse gas emissions 30 per cent below 2005 levels by 2030. Bernier called the Trudeau government hypocritical on the issue, saying the federal carbon price is not high enough to ensure Canada will meet that target. "They won't change anything," he said. "All of the experts are saying that, but the Trudeau government is saying to Canadians, 'Yes, we will achieve our goal with the Paris accord and we'll do our part.' But that's not true." 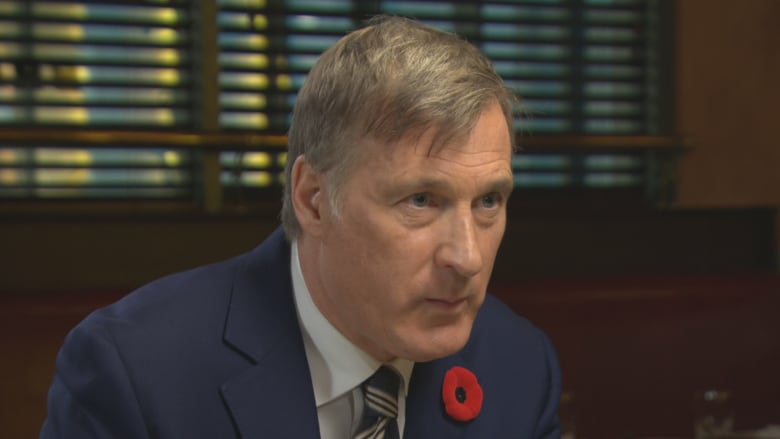 Bernier said he wouldn't set a national emissions target and argued the federal government should play a smaller role in tackling climate change, leaving the provinces and private enterprise to find a solution. "We need new technology to fight climate change and that will come from the private sector," he said. "I will do everything to be sure that the private sector will be in competition and they will find a solution." While Bernier insists he believes in climate change, he still questions whether the problem is caused by humans. "There's two points of view. There is one that is the big majority and one that is a small minority and I'm not a scientist," he said. "Galileo said our earth is not flat and he was the only one to say that at that time, so maybe that minority is right, I don't know. "What's most important is climate change is there and we the civilization, we the private sector can do something." Bernier left the Conservative Party on Aug. 23. Since then, he said, he has raised $435,000 for his new party. "It's all small donations with a lot of donors," he said. Bernier said his party now has a head office and five full-time employees, but he won't release the names of his team members until the People's Party of Canada is officially approved by Elections Canada. As CBC News first reported, the party is requiring all riding association members to sign a pledge promising not to embarrass the party. Bernier said the pledge is to ensure riding association members believe in the party's ideas and platform. "If we had somebody who does not believe in immigration, anti-immigration, that person is not welcome in our party," he said. "We believe in immigration, but we don't believe in mass immigration. We just want to have a little bit less."